A replenishing all over moisturiser, also ideal as under make up. This non-greasy cream will smooth and soften your skin when used daily. Vitamin E is renowned for its anti-oxidant properties, protecting the skin from damaging free radicals. Its nourishing properties help anti-ageing of the skin, reducing the appearance of fine lines & wrinkles. The Cyclax brand was established in 1896, founded by Mrs Frances Hemming who specialised in beauty products for the aristocracy. Cyclax Ltd was granted the Royal Warrant by Her Majesty Queen Elizabeth II in 1961; this privilege is retained to this day. Royal Warrants are a mark of recognition to people or companies who have regularly supplied goods or services to certain members of the Royal Family. Attainment of the Royal Warrant is only achieved by prestigious brands and is regarded as a mark of excellence, high quality and performance. 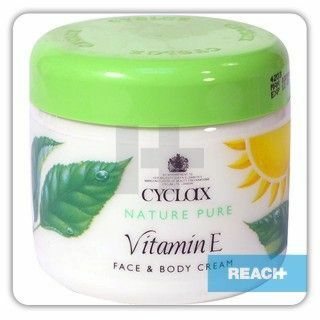 Cyclax excels in skin care, sun care, personal care and depilatory products. Each sub-brand holds the prestigious Royal Warrant offering a full spectrum of innovative, tried, tested and trusted formulations.